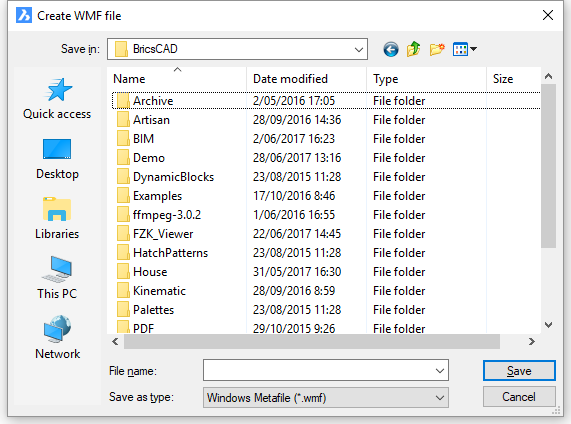 Exports the current view to a file in WMF, EMF, or SLD formats (short for "windows metafile output"). Before using this command, set the viewport the way you wish it to be saved. WMF, EMF, and SLD files can be viewed in the current viewport with the VSlide command. Specifies the name of the slide (snapshot). The PictureExportScale preference sets the scale factor when exporting to WMF or EMF. BmpOut - exports drawings in BMP format. Export - exports drawings in BMP, DWF, DXF, DWT, PDF, WMF, EMF, SLD, and older DWG formats. MSlide - exports drawings in WMF, EMF, and SLD formats.